​Committee members Terry Case, Lorraine Knox, Wendy Sturgess. Photograph of 2017-18 Committee Meeting with members continuing in 2019 Executive names in bold. 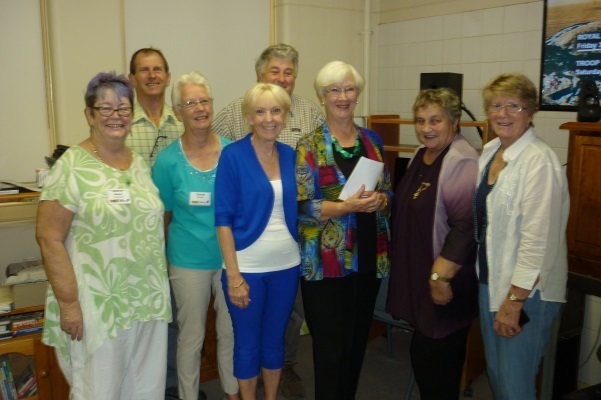 L-R Bill Parris (Vice President), Corrie Witlox (Treasurer), Helen Jeffree (guest); Dorothy Webber (President); Geraldine Macorkell (Secretary), Judith Borthwick (Publicity Officer), Pat Gardiner (Well Being Officer), Lorraine Knox (Assistant Secretary), Terry Case (Immediate Past President) Margaret Jenkins (Research Officer). Absent: Cheryl Turner; Bev Lee and Terry Dillon (Membership Officer).